It is no secret and you have probably heard it all over the news that the world’s population of retirees will sharply increase because of the Baby Boomer generation. It is true and this surge comes at a time when companies are downsizing, the economy is slow, retirement funds scarce, and prices are skyrocketing. It is a scary time for some reaching their senior years because of the rising cost of just maintaining a home let alone paying taxes, utilities, and putting food on the table. More and more, those from this generation are opting to go mortgage-free and enjoy RV living on the open road. This name for this generation was given to the population group of Americans born between the years of 1946 and 1964. Post-war optimism, a favorable economy, and a housing boom during this era had much to do with the rise in family household population. During this timeframe, estimates point to an annual increase of around 4 million births resulting in an addition of between 70 and 80 million people in the United States alone. Other nations such as the United Kingdom, Canada, and Australia also experienced similar increases in relative to their baseline population at the beginning of the boom era. Living on the open road and in the numerous campsites has many perks. For starters, the campsites are packed with facilities that, in a way, raise a person’s standard of living from that of a traditional home. For example, not everyone can afford to have a swimming pool in their backyard but many modern RV campsites offer one for your leisure and for significantly cheaper cost. The commercial RV campsites offer utility hookups, restrooms, showers, cable TV, wireless internet, recreation rooms, and much more. Some of the slightly higher-priced resort-style campsites even offer golf courses. Something else you get when you choose this lifestyle is independence because you no longer have to do home maintenance such as trimming the hedges, cleaning the garage, and mowing the grass. Are the people who drop in on you getting under your skin? With this lifestyle, you no longer have to worry about it. You can relax and focus on your partner going on the adventure with you. Of course if you are a traditional homeowner, you may be experiencing some boredom with the same surroundings and routine day after day. This is not the case on the open road. You can spend one month at a park situated by the beach, another month next to a theme park, and another month nestled in a peaceful mountain atmosphere. The possibilities are endless!. 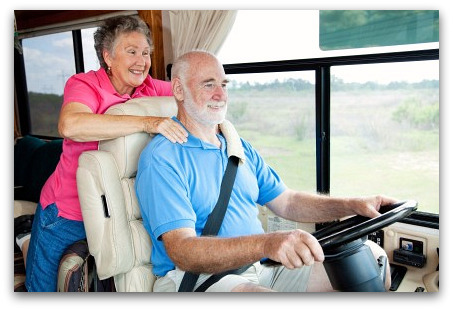 Why is RV living among the Baby Boomer generation increasing in popularity? Well, for starters, there is an increase in the population of retirees because those from this era are reaching age 50 and beyond. Furthermore, the effect of this sharp increase is being felt in other Western nations. In fact, estimates indicate that the number of Americans aged between 55 and 64 dramatically increased between the years 2000 and 2010. The increase was 47% over previous levels of growth in this age range. Of course, the first question one would ask is, "What does the sharp increase in population have to do with RV popularity?" The answer is based on several conditions experienced by the person falling within this age group. First, recent changes in the global economy have made living from an RV attractive because of the reduced cost in addition to all of the perks. Second, those within the Baby Boomer age range have usually surpassed their peak earning years and it no longer makes sense to dedicate most of their time to working in a traditional job. For some, their choice to work in a traditional job or retire has been made for them because of corporate downsizing. Third, many within this age range just want to realize their lifelong dream of being able to travel for more than two weeks each year. Today, the cost of camper living is even more of a factor in the decision to make this a lifestyle for the Baby Boomer. The burden of property taxes, home maintenance, utilities, and home luxuries dampen what used to be known as "joy of homeownership". With an RV you can equip yourself with a few tax calculators and estimators and find the most ideal tax scenario for you. After all, the entire country is your playground. Additionally, because of the global financial crisis that began back in 2007, those with contributory retirement accounts such as the American 401K saw significant reductions in the value of their holdings. Of course the values of government pensions have failed to keep up with the rising cost of living. For these people, it just makes sense to sell the expensive home, become mortgage-free, and move into a more affordable and mobile RV. Cutbacks in employee staffing have played a part in more from this generation seeking something else to fulfill their time rather than just existing as an employee. Many of those in their 50s and beyond have already experienced their peak earning years and it makes no sense to take a job with another employer only to work twice as hard at half the pay. In other words, it is not uncommon for a person in their 50s to be cut out of a job and not be able to find another at the same level of income. The solution is simple. Sell the house and live on the open road. And finally, many have spent their lives working and raising children and were unable to travel the way they really wanted to. Living in RV makes that dream come true. There is so much to see and do in any nation with an integrated highway network and a multitude of RV parks to choose from. If you are a Baby Boomer, this lifestyle might be something that will make your golden years the most fulfilling. Join in and share your Full Time Rving story on the simple form below. Do you have a picture to add? Maybe a photo of your RV? Great! Click the button and find it on your computer. Then select it. A Leap of Faith BUT......The Best Decision of Our Lives!